After Thanksgiving, I usually try to see if I can survive the rest of the year on cookies and party appetizers (I can't). They're two of my favorite food groups, and since the season is overflowing with an abundance of both, it only made sense to try to survive on these delicious little treats alone. My waistline called an intervention and quickly put an end to the "all cookies and appetizers from Thanksgiving to New Years" party. Hey waistline, why you got to be so mean? Just because my all-day, every day app party has stopped, doesn't mean it has on the blog. Here to help you with your winter layer, or holiday parties/get-togethers/celebrations, whichever you prefer, are 3 easy Christmas appetizers (similar to my 3 easy Thanksgiving appetizers from last year). All three can be made in less than an hour, which means you'll be on your way to one app happy party in no time. P.S. To make these all under an hour, here's the game plan- Tarts first, prep the dates while the tarts are cooking, toast the bread rounds for the pizza immediately after the tarts come out of the oven, turn the oven down and bake the dates, assemble mini pizzas while dates are baking. Proceed to feast. P.S.S. 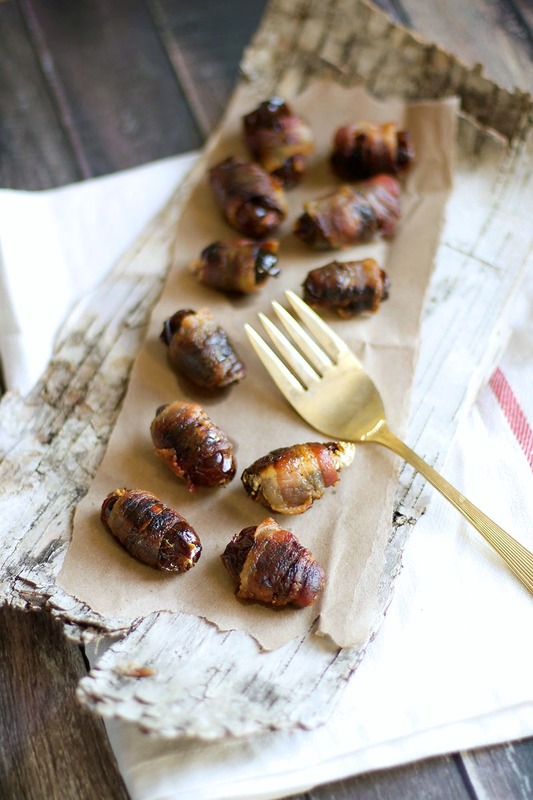 These all make really great breakfast treats, too, (holiday appetizer brunch bar anyone?? ), in case you have any leftovers, though that is highly unlikely! In a small bowl, whip together the ricotta orange juice, and honey. To assemble the tarts, cut a square of puff pastry about 3"x3". In the center dab a small amount of the ricotta mixture (about 1 teaspoon). Place a quarter of the fig on top. Fold the sides up and over to form an edge around the filling, leaving the center exposed. 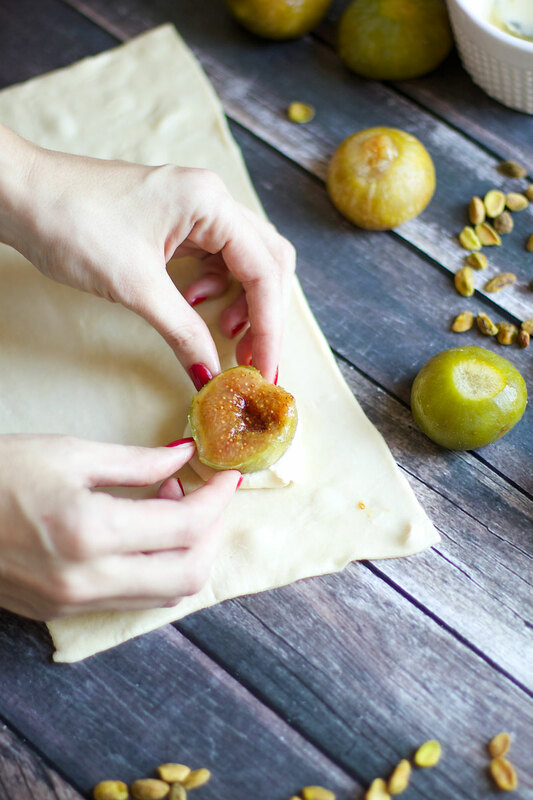 Place on the baking sheet and sprinkle with a few pistachio pieces. Continue on until you have used up all of the ingredients. Baked the tarts for about 18-20 minutes, or until the dough has turned golden brown. Remove from the oven and allow to cool on a cooling rack. When you are ready to serve, place on a dish and dust them with powder sugar. 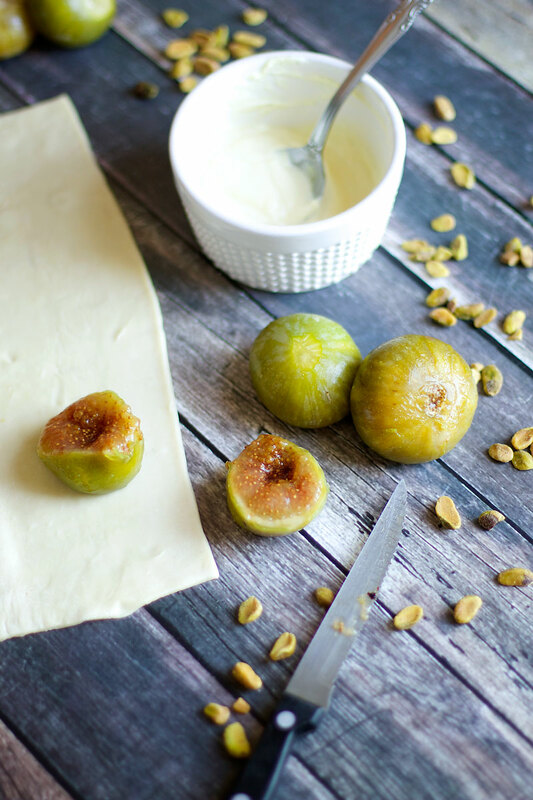 For the figs, you can use fresh or frozen. I happened to use the frozen ones from Trader Joe's. Just make sure to fully defrost them and drain off the liquid first. These can be made 4-5 hour in advance. Store any remaining tarts in an airtight container in the refrigerator for 2-3 days. Preheat the oven to 375 degrees. Line a baking sheet with non-stick foil and set aside. Split the dates in half (but don't cut completely through). Stuff a small amount (about 1/2 a teaspoon) of cream cheese in the middle, then fold the date back together. Wrap tightly with a piece of bacon, then place the date on the baking sheet. Continue on until you have used up all of your ingredients. 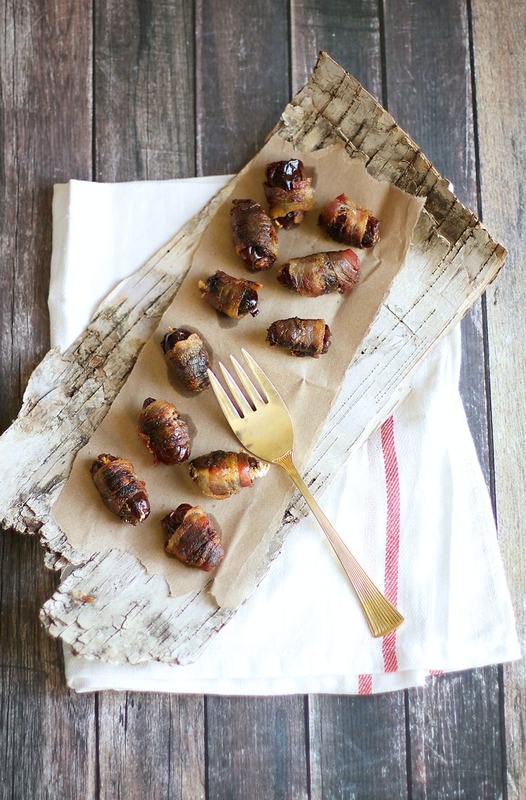 Bake the dates for 15 minutes, then flip them over using tongs, and baking another 2-5 minutes, or until they are crispy and the bacon has fully cooked on all sides. Store any leftovers in an airtight container or ziplock bag for up to 2 days in the fridge. Place the bread rounds on a baking sheet, cut side up, and toast them for 5 minutes at 400 degrees. While they bread is toasting, in a small bowl whip together the mascarpone, cream cheese, liquor, honey and orange juice until well combined. After the bread has finished toasting, allow the rounds to cool for about 2-5 minutes. Once cool, spread each half with a little of the mascarpone mixture (I used about 1 teaspoon per half). 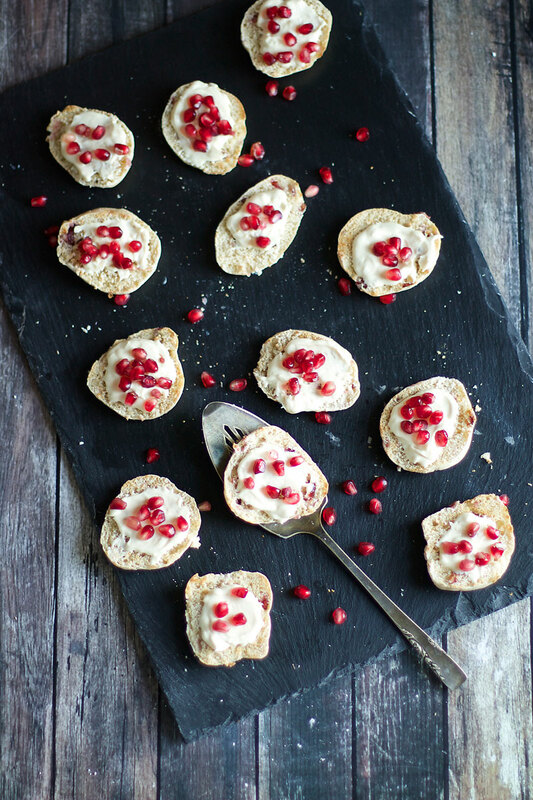 Sprinkle with pomegranate seeds and place on a serving tray. Serve immediately. Feel free to adjust the honey and liquor deepening on your taste preferences. For the bread rounds, you can use any of the mini buns found in the bread aisle at your local grocery store. For these I used, Ozery Bakery's Cranberry Orange Snacking Rounds (I'll add a link below).